It’s easy to understate the importance of the Touhou series. This bullet-hell shmup franchise by largely enigmatic solo developer ZUN has been a pointedly Japanese phenomenon, although its influence has been felt in the evolution of the genre worldwide, and has helped lead even larger developers away from arcade cabinets and towards the PC as a viable platform for this particular breed of retro thrills. Despite being so enormous a franchise in Japan that it has its own dedicated twice-yearly convention, these games have always been hard to get hold of in any legal capacity in the west. 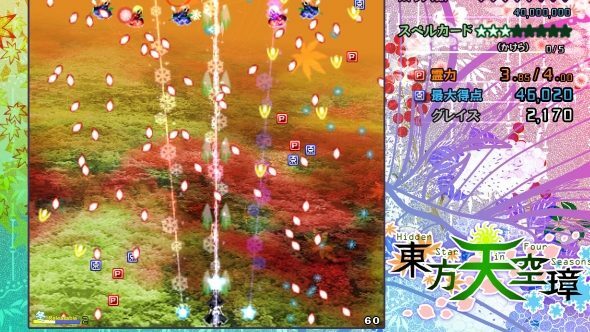 That all changes this month, as Touhou 16: Hidden Star In Four Seasons arrives on Steam. Can’t get much more indie than Touhou, but it’s surprising how few games on our list of indie greats are Japanese. So as not to be misled by the english text and incorrect release date (it’s due November 18th) in the unofficial trailer above, it seems prudent to mention right away that while easily purchased anywhere, Touhou 16’s Steam release will be purely in Japanese, although this isn’t as big of an issue as you might assume. Zun – the enigmatic developer of the series – is largely a mystery to fans, but we know a few key things about him: He loves his booze, he can’t draw worth a damn (his character art hasn’t improved much since the 90s), he’s great at designing geometric fireworks displays made out of bullets and he’s a strong composer despite his love of MIDI synth horns. More notable facts are that he is fiercely protective of his own works, not wanting to relinquish them to any publisher or localization group, preferring to sell directly to fans, or as close to it as possible. Despite this, he has a more-than-friendly relationship with fan-works, going as far as giving several ‘unofficial’ Touhou games blessing to be sold as commercial titles online and even on consoles abroad. As such, he is more than happy to allow unofficial translations of his games, and the fans have very much obliged. In short, expect an unofficial but high-quality english patch released for Touhou 16 version within hours of its November 18th Steam launch, if not sooner, with localizations for just about every other language following not long after. It has also been reported (credit to AnimeNewsNetwork) that Touhou 15.5: Antinomy Of Common Flowers – a spinoff fighting game by larger indie team Twilight Frontier – is also slated for a Steam release sometime in early 2018.